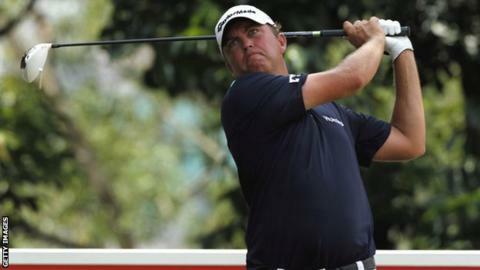 Bo Van Pelt narrowly missed out on breaking 60 but still moved into a share of the lead on day three of the Asia Pacific Classic in Kuala Lumpur. The defending champion, 37, needed a birdie at the last for a 59 but instead made a double-bogey that saw him finish with a nine-under-par 62. He now shares the lead with fellow American Robert Garrigus on 16 under. A double bogey on the 14th marred Tiger Woods' round of 69 as he finished on 11 under, in a tie for 10th place. Only five players have shot rounds of 59 in fully sanctioned US PGA Tour events. Only five players have shot rounds of 59 in the history of the US PGA Tour, although Van Pelt's effort would not have counted in the official statistics as the event is not a fully sanctioned competition on the Tour. He said: "Surprisingly, I wasn't really nervous at all, but I've never had that good a chance to shoot a 59 before. "Obviously I'm disappointed to finish with a double, but I'm really proud of the 17 and a half holes I played before it." Woods began in joint fifth and made birdies at five of the opening eight holes but then had a double at 14 and bogeys at 16 and 17. Garrigus, who started the day with a two-shot advantage, shot a two-under-par round of 69. Chris Kirk is in third on 15 under with Zimbabwe's Brendon de Jonge and South Africa's Jbe Kruger on 14 under. "I'm going to have to shoot a low one tomorrow, something similar like Bo did today," said Woods, one of five men on 11 under. "But the problem with being this far back is I'm going to need help and a great round might not win it. I was right there but I made a couple of bad decisions." Scotland's Martin Laird is tied 19th on nine under following a 69.